This semester, my Fiction: Craft and Theory class has been studying all the elements of the genre, each week applying one of those discreet elements to individual short stories: point of view; characterization; time and pacing; mood and setting; narrative style, etc. And then at the end of each semester, we apply all of those elements to a recent novel. This year, I assigned a novel that blew me away when I read it in galleys: VERNON DOWNS, by Jaime Clarke, just out from Roundabout Press. 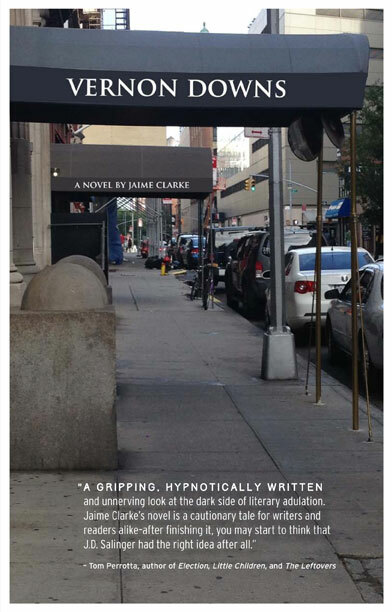 Tomorrow night (Weds, 4/30), my class will take a field trip to the national treasure that is The Center for Fiction, located in midtown Manhattan, where, at 7 PM, Jaime Clarke will be in conversation with Charles Bock . Please join me. There’s a great Irish bar across the street, to which, after the event, attendees might repair. April 2014 issue of The Brooklyn Rail is here! The April issue of The Brooklyn Rail is here. More pieces will be coming along soon; and over the next couple of weeks I’ll be posting highlights. I’m so proud of the Rail’s In Conversation series. And so excited to announce that Matt Bell will be our regular monthly Books contributor to this long-standing interview series. As those who know him will attest, Matt is a tireless supporter of the literary community and a friend to all writers. We couldn’t prouder to have him on board. In addition to Matt’s feature, this month’s In Conversation series has some wonderful contributors:Benjamin Percy talks with Daniel Levine about Dan’s debut HYDE. And Ben Pfeiffer chats with Adam Wilson about Adam’s new story collection WHAT’S IMPORTANT IS FEELING. Upcoming contributors will feature John Domini, Lance Olsen, Scott Cheshire, David Burr Gerrard, Elzabeth Trundle, and Pamela Erens. Stay tuned. Special thanks to the indomitable Sara Roffino, Books editor-extrodinaire Katie Rolnick, and the brilliant and generous Erin Harris. Check out the new Books section here.